May is Mental Health Awareness Month in the United States, and with the way things are going, the state of Alabama is going to celebrate by cutting mental health funding even more, and pretty much screwing all who needs mental health help, or has an intellectual disability. On Tuesday, the Alabama House passed the doomsday budget that has major and backbreaking cuts. The budget cuts would cut mental heath 5 percent, on top of the 40 percent already cut since 2007. When state funding is cut, it will also mean federal matching dollars are also cut. So that 5 percent cut is almost like a 15 to 20 percent cut. Everyone from Mental Health Commissioner Jim Reddoch to Terry Prezent, the Executive Director of The Arc of Alabama have said these new cuts will pretty much devastate mental health services in Alabama. I mean, if around $100 million is cut on top of the budget cuts already made, how can mental health and intellectual disability services operate in Alabama? It pretty much can’t! People like me, who has Asperger’s Syndrome / Autism, are very productive members of society, but our legislature is like The Grinch, who steals all the Christmas presents, and hears the cries from the Who’s in Whoville, but instead of having The Grinch’s heart grow three times as big, it shrinks three times smaller, and The Grinch sells those Christmas presents on the Whoville black market. It’s that bad! Here are some facts about mental health that you need to know, before our legislature thumbs their noses and votes yes on these major budget cuts. The national average for waiting for mental health service is 11 months; it’s much longer in Alabama. Alabama is dead last in what it invests in the developmentally disabled community. And Alabama provides no services for those with autism or Asperger’s. Yep, zip, nada, nothing! This could be a big reason why I am still sitting here unemployed with Asperger’s and living in Alabama. There is basically nothing to help those on the Autism spectrum, and you are stuck living with relatives, being homeless, being in jail, or being in a stuck pattern with nothing to do. 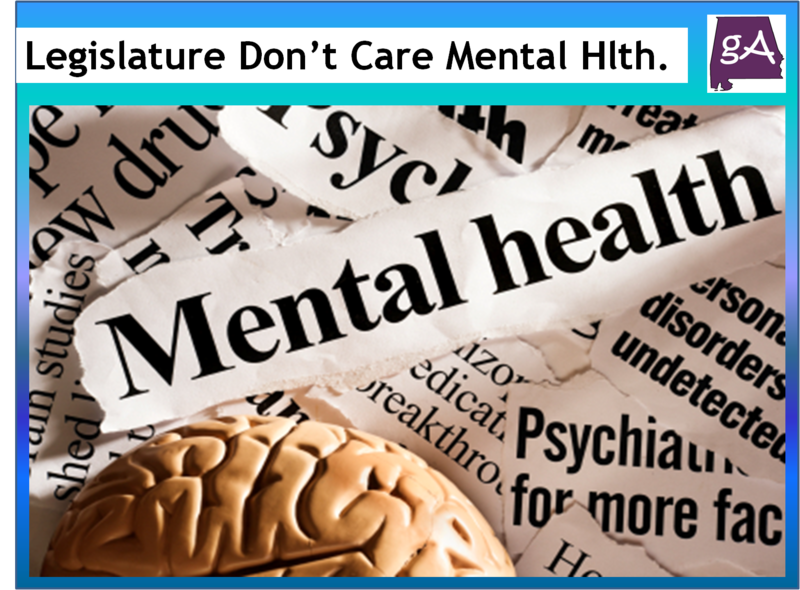 All of the warnings about the up to $100 million budget cuts to mental health have had no impact on the legislature sadly. Governor Robert Bentley has proposed several revenue increases to prevent the budget cuts, none of them have come up in committee. The Alabama House also had some revenue increases being proposed, but none has come up to a vote. Meanwhile, over in the Alabama Senate, leader Del Marsh is proposing a lottery and expanding gambling in Alabama. You know how it is in Alabama, people are deeply Christian and they are being sermoned by their church pastors about how a lottery and expanded gambling will be bad for Alabama and their faith. The chances of expanding gambling and lottery passing the legislature are small, and even smaller if we get to vote for it. So, who can I talk too so I can at least try to get in their head and brains, and maybe re-wire it so he can think about what these major budget cuts would have on Alabama, let’s talk to Senate leader Del Marsh! Del Marsh is one who thinks Alabama will allow a lottery and gambling, and if I get a chance to vote for it, I would vote YES! That is, if we even get a chance to vote on this. Several people are starting to put the blame on Del Marsh for not listening to the people who are crying wolf about these major budget cuts. I mean, even Mike Hubbard, who is facing corruption charges, even proposed tax increases, that is how bad the general fund budget deficit is! These general fund cuts will have serious consequences not only to mental health, but also to prisons, Medicaid, Human Resources, youth services, and anything else not education in Alabama. And the state cuts to mental health are not the only bad impact. Did you know that Blue Cross Blue Shield of Alabama pays a lot less to psychiatrists! They are paid $101 by Blue Choice versus $154.73 by Medicare. Yep, way a go chasing way all the mental health professionals in Alabama. Hey Del Marsh, you can help stop all of this, but you have chosen to not lift a finger, and listen to those who drinks that sweet tea supplied by the tea party. So Del Marsh, and everyone in the Alabama Senate, do you care about the wellbeing of those with intellectual disabilities? Do you care about those who needs Temporary Assistance for Needy Families? Do you care about those who needs a court trial? Do you care about those who needs Medicaid? Do you care about the elderly? Do you care about our children and Headstart? Do you care about reforming our prisons so the feds can’t come and take over? Apparently, you Del Marsh and the Alabama Senate does not care, and you only care about listening to those with the power, you wants to force the poor to pay more taxes while they pay less taxes, that is the world we live in Alabama. If Robin Hood ever stepped foot inside this state, he would be captured, tortured, and beaten to death. So the question is this? Alabama has an important choice that will help determine what kind of state our children and grandchildren will inherit. Do we raise new revenue to protect vital services like health care and public safety? Or do we erode our state’s quality of life with devastating cuts to those services? So far, the legislature is siding with the latter option, and Alabama would suffer the consequences of that choice for years to come. It’s not just the people in the legislature; many people in our state do not really understand how bad things are right now! They simply go about their daily lives and base their opinions on what they hear at church, work, or on social media outlets. Let’s get something straight; things are in a doomsday type of bad! This state cannot just keeping cutting and cutting like what you see when landscapers cut the grass. A change of thinking and political attitude is something the state of Alabama badly needs! Who cares about who gets hurt in the process? Who cares that this budget will cause federal lawsuits that will cost more than the money the cuts will save? Who cares that cutting the prison budget will make reform impossible and cause the Feds to take over our prisons and impose tax increases on us that they choose, because our legislature is full of gutless wonders who reuse to actually lead! The legislative body is not at all confused about this situation. They just refuse to lead us out of it. What might help get the people in the legislature moving? Let’s print out some old west wanted posters with their faces and names on them. Since lots of people need some extra money in Alabama, put a big fat reward on the poster, that will get the people to turn on their elected leaders! In all seriousness, what really needs to happen to our lawmakers is the same thing that happens on the Adult Swim show Robot Chicken. We should strap them into a chair, prop open their eyeballs and ears, and force them to watch TV programs about the right way to run a government. Some time watching some Schoolhouse Rock, Sesame Street, and other educational shows might be the wakeup call our legislature needs to lead Alabama the right way. But, I am thinking too hard, and none of those things will ever happen. What will most likely happen is the major budget cuts will be passed, lawsuits will be filed, the federal government will come in and take over parts of the Alabama government, and it will be like Noah’s Ark. Where the rich, powerful, and tea party supporters will be on the boat, while all the poor, disabled, and Democrats will be left to drown. What a great message to send about Alabama to the rest of the world!